They say that life is all about the journey and not the destination!!!! When it comes to my artwork, I can do nothing but agree. I never know what the final design will look like until it’s completed, since many things happen during the creation process that influence the final design. 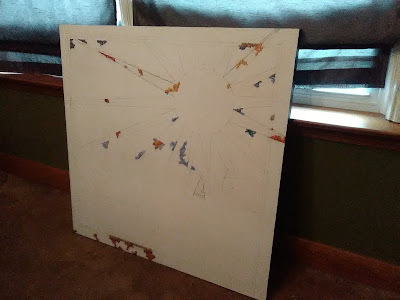 Just a short while ago, I came up with a fun idea that would allow me to work with Devon on a collaborative artwork!!! Since this project will take a few more months to complete, I thought that it would be cool to share this journey with you – my readers!!!! Every week (or so) I will add photos and stories to this post, at the bottom and in sequential order. 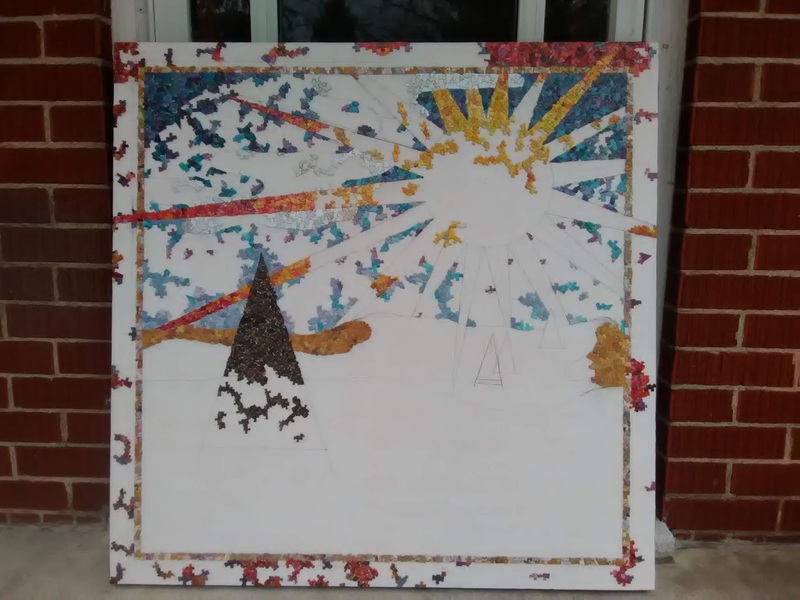 So – drop by, from time to time and take a scroll down to watch this artwork project unfold…..
We love working on puzzles during the winter months! It’s something fun that the whole family can enjoy… although Joanne seems to be the one doing most of the work!!!! Devon and I will sit down, every now and again and do a bit of work, but Mom seems to really enjoy it, so we let her have her relaxing time! 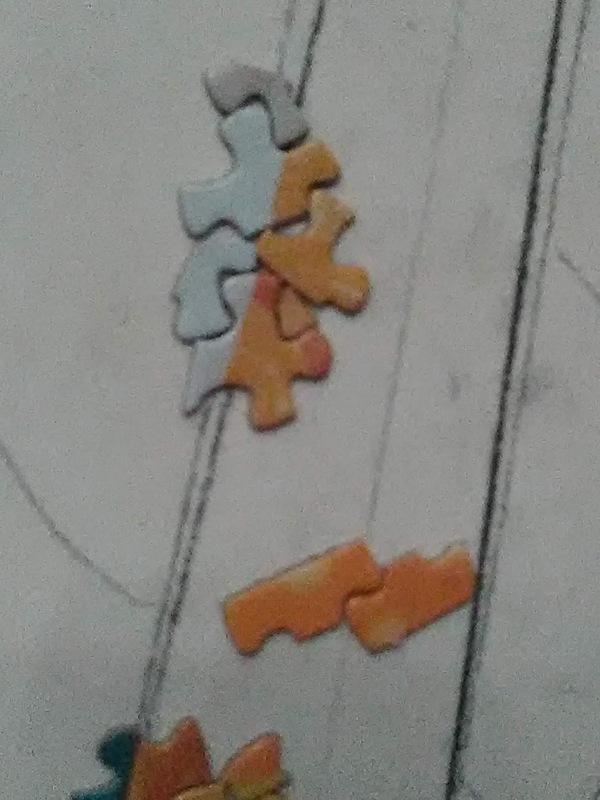 That’s a little ‘tongue in cheek’ because Mom often times gets mad at the puzzle!!!! But if yelling at a puzzle helps her to relax, then I say ‘Go for it!’. LOL!!!! 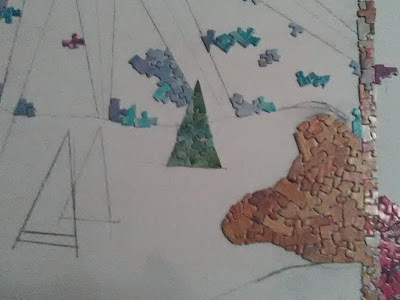 So – we’ve built up a small collection of ‘done’ puzzles and one evening, I remembered that I had once created an artwork using nothing but jigsaw puzzle pieces. That was way back in 2001, when Joanne and I were living in Nelson, British Columbia as we worked on the art project entitled ‘Canada: Glorious To Be’. 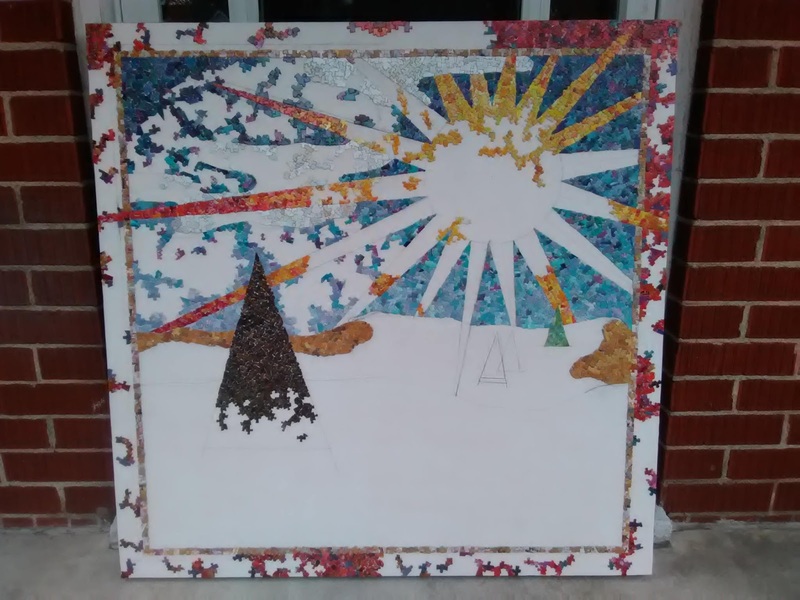 Thinking about this memory got my imagination working and it was a few days later, when I decided to do another puzzle piece artwork! I figured that I could design the image in a way that would be easy for Devon to understand so that he could participate in the project with me. 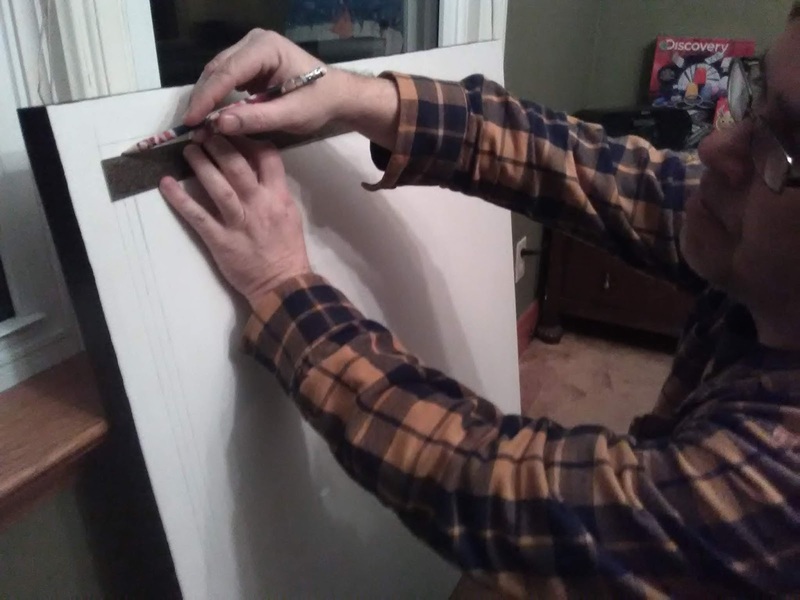 I shared the idea with him and he said that he would help with the new project. So – it was time to get started…. 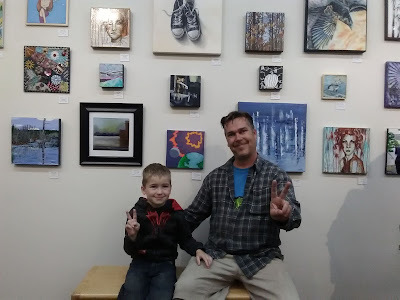 Since I have been participating in several ‘Hip To Be Square’ art shows over the last few years, I suggested to Devon that we buy a square canvas so that we could enter this artwork into an upcoming exhibition. That way, many people could enjoy our creation… and just maybe we could sell it and use the money for his swimming or piano classes. 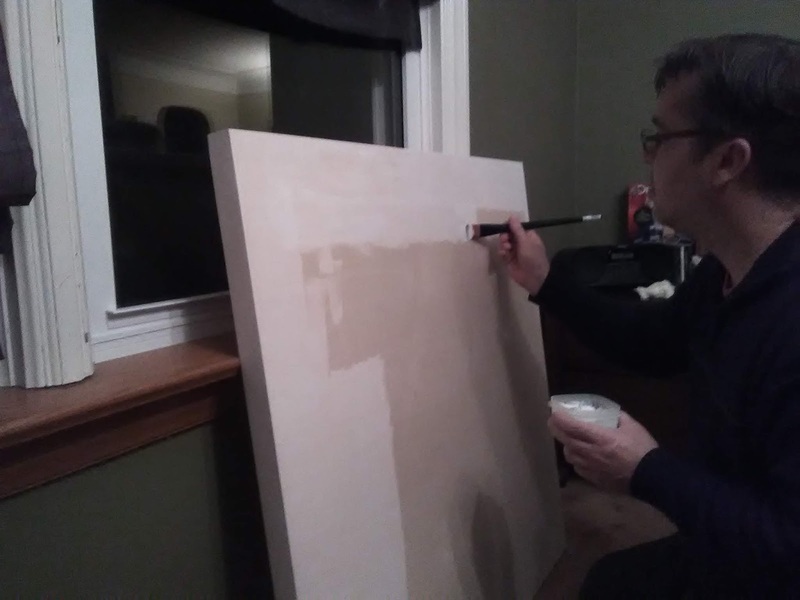 When we got home, I began prepping the wood canvas with two coatings of gesso!!!! After the gesso had dried, I mixed up a nice dark purple colour to paint the border’s edge. I wanted a plain and simple edge that would complement the final artwork without distracting the viewer – as I have often times created interesting borders in the past! This time, I want viewers to only focus on the artwork and not the edge design!! Then, we had to come up with a design! For several weeks, my imagination went wild. I thought up all sorts of interesting things that we could do! In the end, we decided to copy another artwork that I created a couple of years ago…. The first peaces to be glued down! And after one hour, some more border colours are done! It's always good to 'get your feet wet' whenever you begin a new project. After this first day, it was time to get moving forward! I spent some time laying out the design for this project. In the above image (the one that we are using as inspiration for this art) you'll notice that the sun is touching the horizon. As I was laying out the lines for this art, I showed Devon how I was using a small dinner plate to draw the circle for the sun and I asked him where he thought the sun should go. He decided to put it more into the centre portion of the sky... and so I did! When we started, I was showing Devon how to do everything. 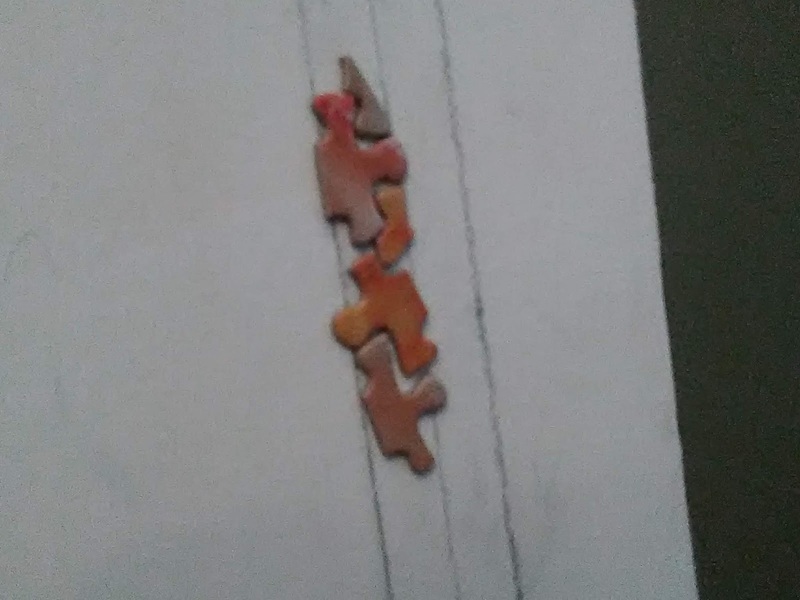 How to pick a puzzle piece to use... how to find a spot where it will fit.... how to glue the back side of the puzzle piece... how to hold it in place until the glue dries, etc. 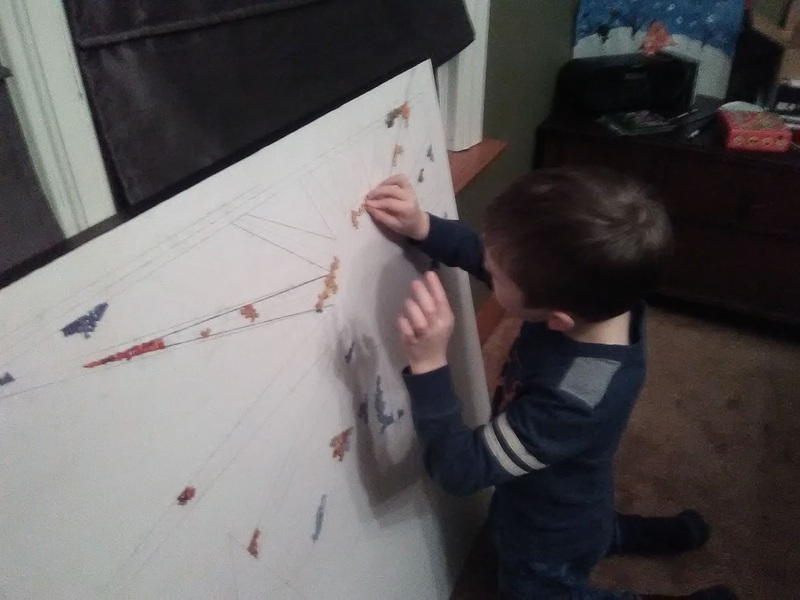 I knew that there were going to be many places where I'd have to do the work myself - like where colours intersect and small details that would be very hard for Devon to do - but my goal was to find ways for Devon to work on his own, with very little supervision. So... 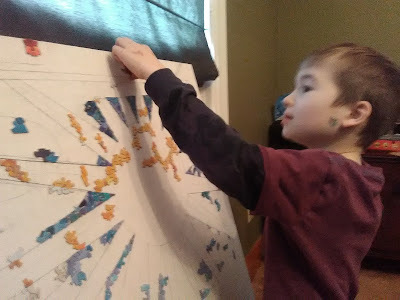 I got him to work in the large areas of the design. I'd glue one piece down for him and then tell him to make a 'snake' having his puzzle pieces expanding outward from where he started. This worked out very well. 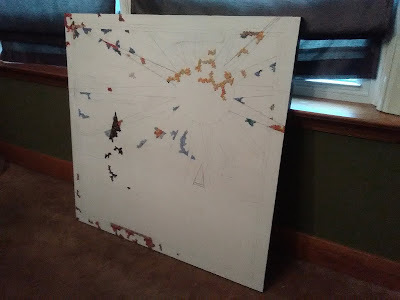 When Devon first began working on his own, I was working right beside him - working on another part of the art. 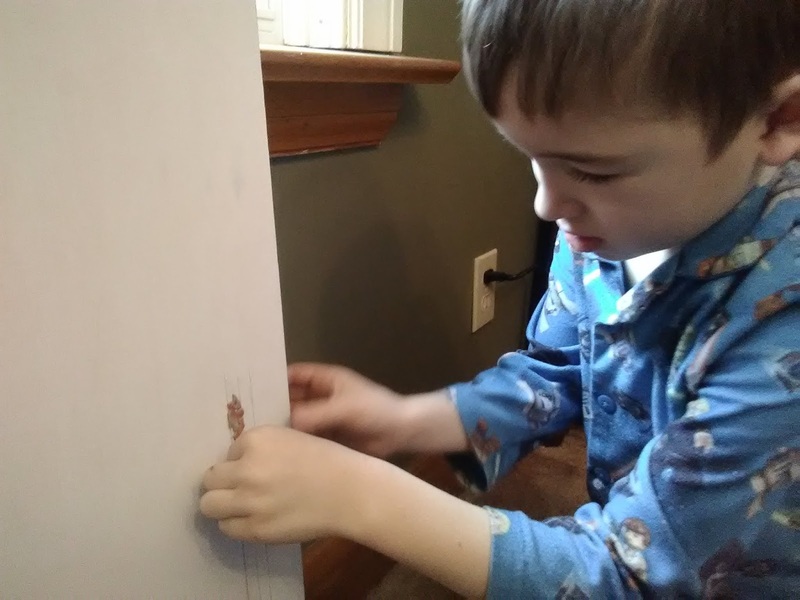 He would ask if he was doing it right - I'd say yes or give him a little guidance - and then he'd continue with his work. After a while, I told him that he's been doing such a great job and that because he understands what to do, he doesn't need to ask me any more questions!!!! And he proved me right!!!! Whenever I'd inspect his work, it was always perfect!!!! Great job, Devon!!!! I began this post by saying that life is about the journey and not the destination. 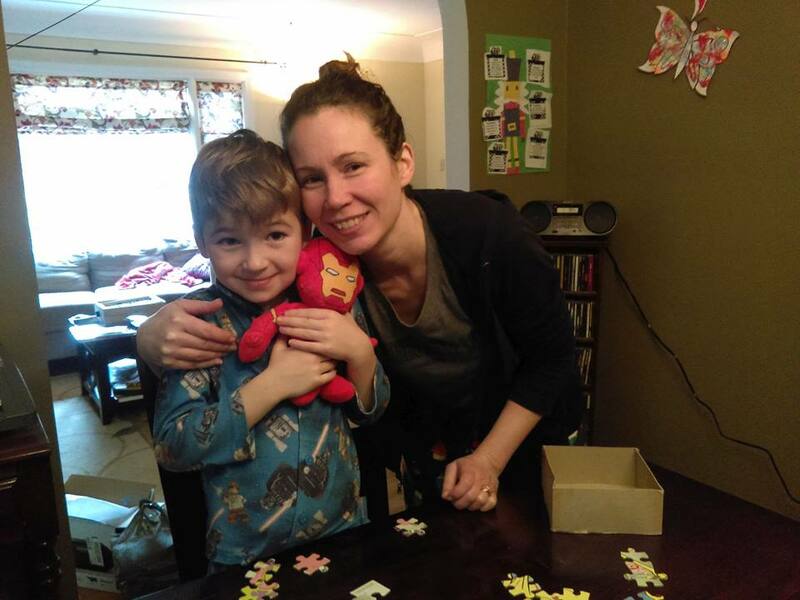 This magic moment is an example of all the fun things that happen during the journey! 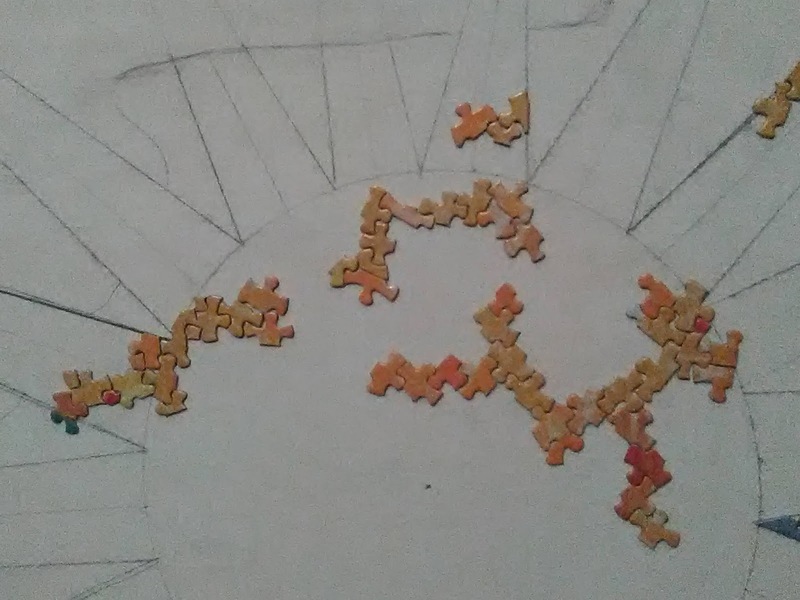 So - Devon was building his 'snakes' using yellow and orange puzzle pieces to fill in the middle of the sun. At one point, he called out, "Hey Daddee!!!! Look how well this piece joins my two snakes!" 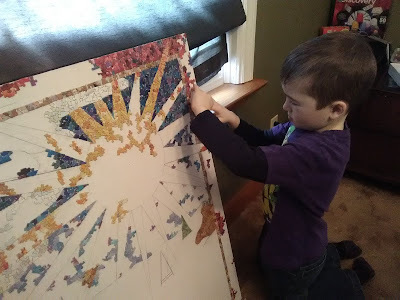 I looked over and noticed that he was holding a yellow puzzle piece in his hand and then he had me watch him as he put it on the canvas. True enough, it fit amazingly perfect and now two separate 'snakes' were joined!!! Some may think that this is rather trivial, but for me, it's quite dynamic! I actually feel rather 'universal' or full of karma during moments like this. Just think about all the randomness that is happening during this art process.... and then, suddenly.... a form of unity comes into being!!!! I love moments like this!!! Random placements find unity and karma! 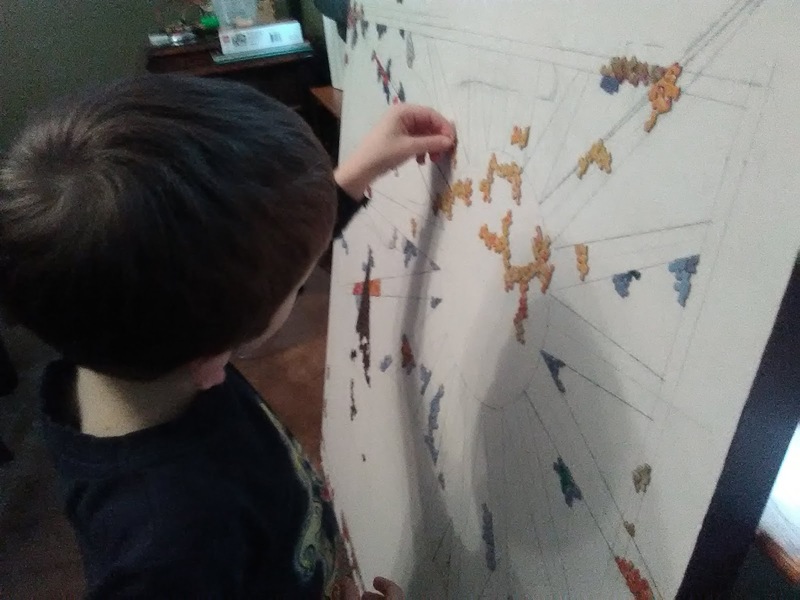 I showed Devon how some of the puzzle pieces I was sorting out, had two colours on them. 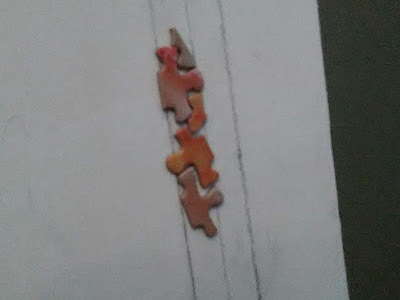 The first ones I found had both yellow and white colours. 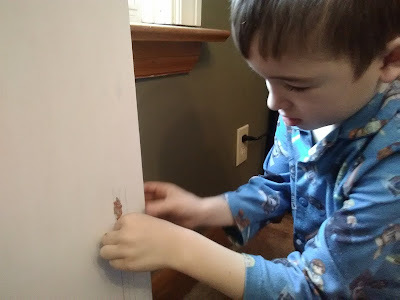 I told him that we can glue these pieces to the art just as they are - we didn't need to separate the colours. So, we found areas where the sun's ray was touching an area where the cloud is and we glued them on! 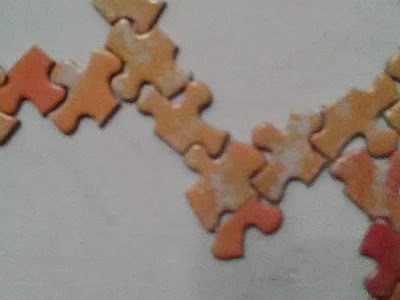 The first few times we did this we were using yellow and white puzzle pieces... but, a short while later, we found some blue and white pieces, as well!!! I wonder if viewers of this art will ever notice this very small detail??? 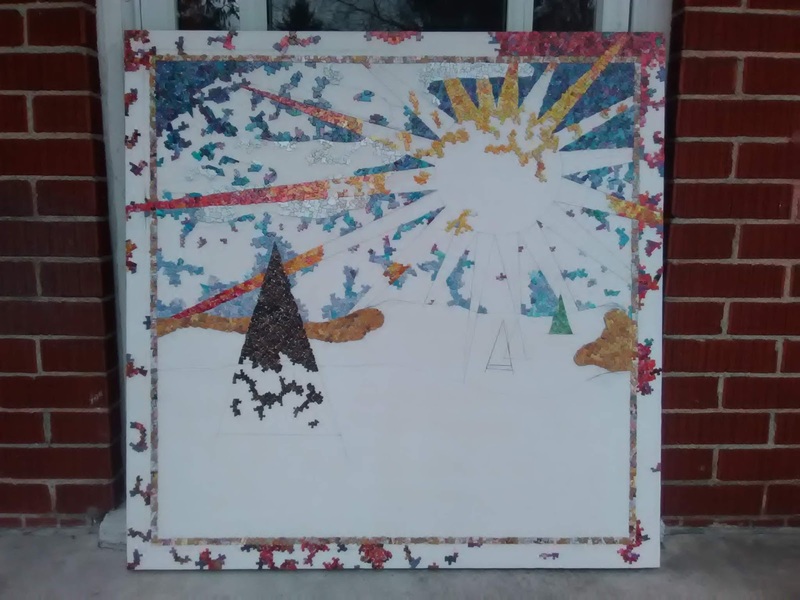 When we first started this project, we had lots of fun tossing a blue puzzle piece over there, a red piece over here and yellow pieces over here and there! LOL!!! 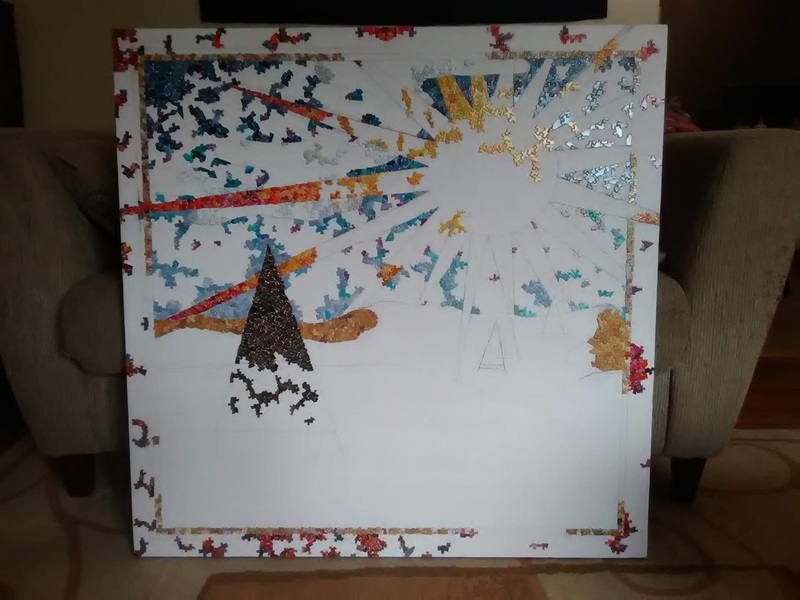 After a bit of this, I decided to see if there was an area that we could complete so we could get a better sense of what the final image would look like! That’s when I noticed that the sky had 5 small areas that could be completed in just a few hours. 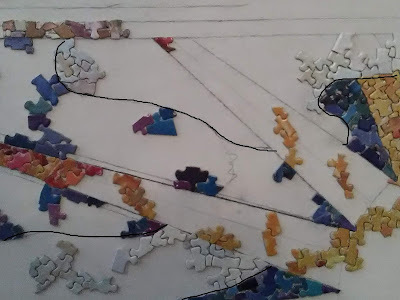 I gathered together my entire pallet of blue and purple puzzle pieces and went to work!!! Just behind my work area, in our dining room, we have also been busy working on completing another puzzle. 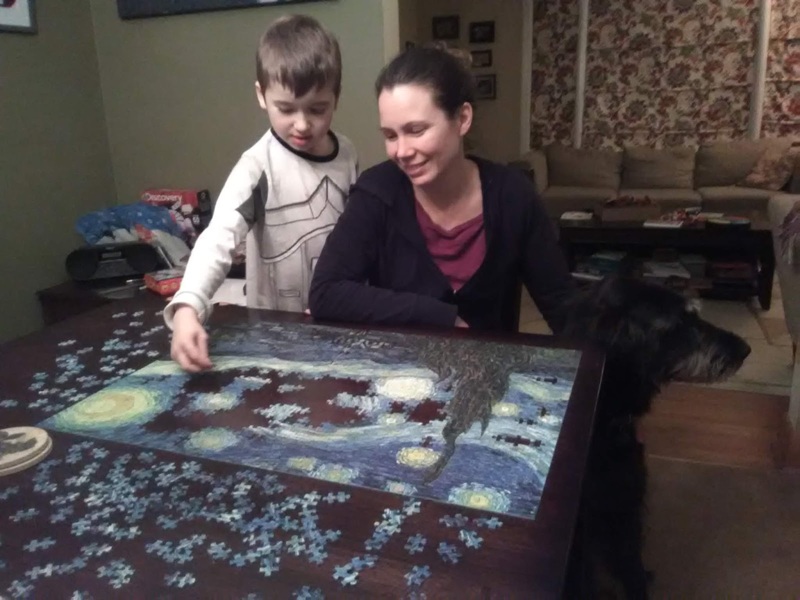 ‘Starry Night’ by Vincent Van Gogh is amazingly filled with so many blends of blue that I knew I had to use this in my art…. but Joanne got mad at me every time I suggested that she work on a different puzzle, so I could get my hands on this one!!!! My bad!!! So, I have to wait!!!! 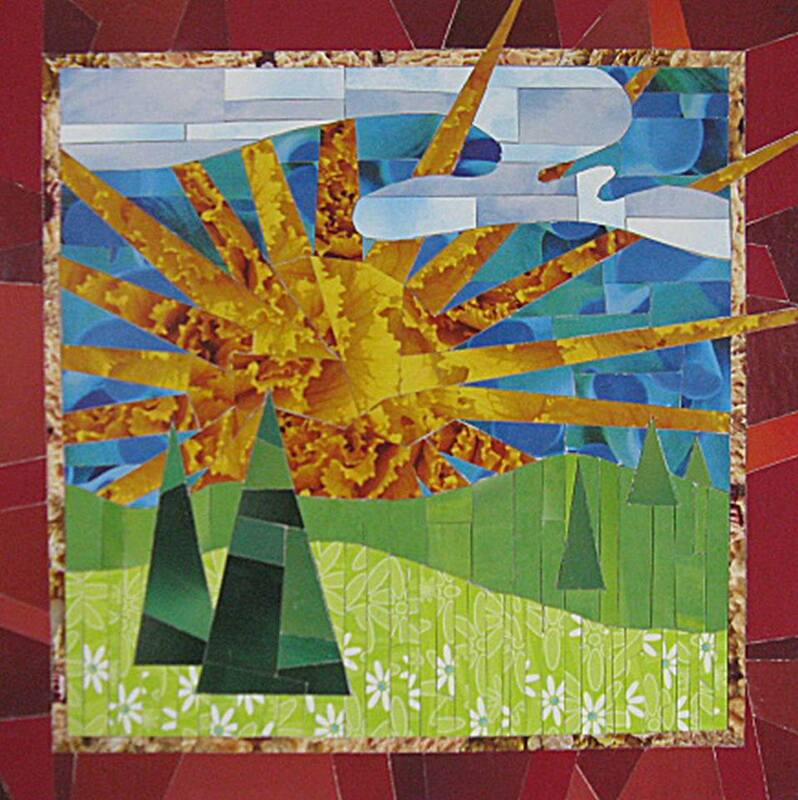 The foreground of this artwork is fairly simple – there’s two hills of grass with a few triangular shaped trees. The grass area is quite large and I’ve always felt that this will be difficult to find enough puzzles with green in them… so I decided that I had to add a new design element! That’s what I love about creating art. I get an idea – I plan it out – I begin the work – and then things change! That’s why I thought many of you would enjoy following along with this adventure, so you could see how things change along the way. So – I pulled up a chair and sat down and thought about how I could change my foreground. As I sat in my contemplative mind, a memory from my childhood came to me and I found inspiration!!! I grew up amongst some of the loveliest landscapes in Southern Ontario. There was a lot of farming, but because the area is so laden with gravel and sand many large patches of land are left fallow, or used as grazing fields for cows or sheep. 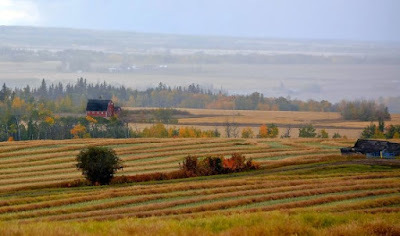 I used to adventure through these rolling hills for hours and hours and the one memory that came to me was of one farm that was filled with rolling hills… and sand! Lots of sand!! These sand dunes were very susceptible to erosion caused by wind and rain and they looked so beautiful as they were always changing the look of the landscape. So – sand dunes here we come!!! Dreaming of a Better World is a great example!! I’ve even woken myself up because I’ve been laughing or talking really loudly, while I was sleeping – the sound of my own voice woke me up. On several occasions, Joanne has told me that I sounded like I was talking in an alien language, in the middle of the night!!!! I laugh and tell her that I must have had another visit from my spirit gaurdians!!! 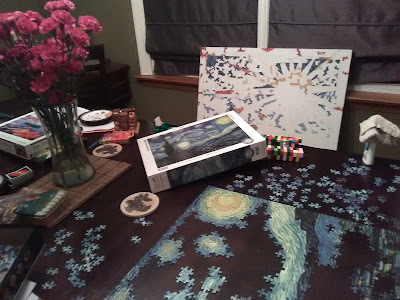 A little while ago, while I was making breakfast and lunch for everyone, Joanne came into the kitchen and told me that I must have been dreaming about my puzzle art, that night. She said that I sat up a bit and started saying, “Just make sure you cut the pieces first! !” a few times before I rolled over and flopped back to sleep!!!! This story cracked me up! 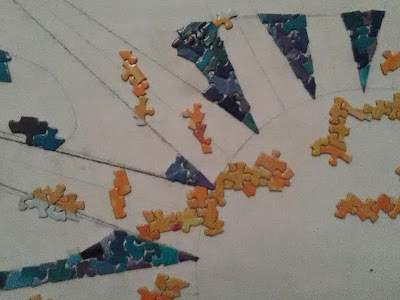 This just goes to show how connected and focused I get while working on my art projects!!!! I mentioned earlier that I'm patiently waiting for this puzzle to get completed!!!! 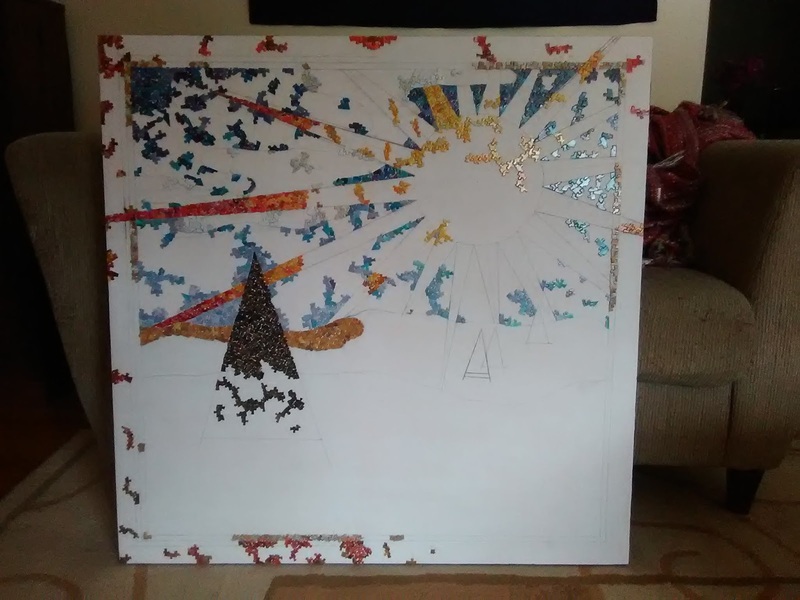 As soon as it's done I'll be able to get back into the sky part of the puzzle artwork! Hurry up, you two!!!!! LOL!!!! I always enjoy putting some kind of cloud into my landscapes. In this first photo, you’ll see that I’ve added a black line around the outside edge of the cloud, to make it easier for you to see…. As the weeks have gone by, I’ve been looking at this cloud and wondering if maybe it’s just a little too much cloud for this image? 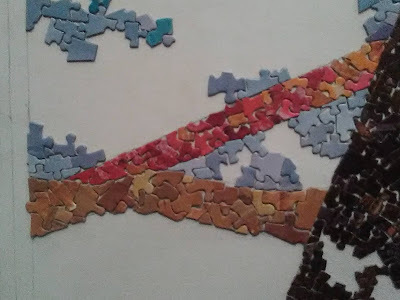 Then, one evening, I decided that it was too much… but what to do?? The cloud just took up too much room and I didn’t want it fighting for attention against the beautiful sun. So, I turned the one big cloud into two smaller ones. Because a lot of the sky has already been put into place, I couldn’t make a very drastic change, but I found that this small change made a rather big difference. In this photo, you can see that I simply erased one small line to divide the cloud into two. The bottom cloud now looks like it ends behind one of the sun’s rays while the top cloud continues to weave its way between a few of the sun’s rays. In the end, I’ve decreased the size of cloud by just a little bit, but the ‘weight’ of the cloud has decreased quite dramatically!! 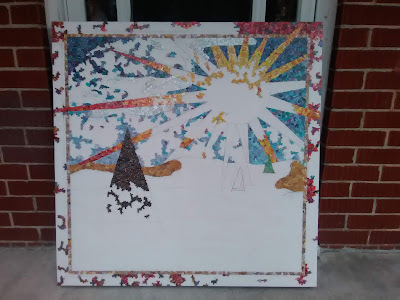 Just the other day, I finally completed the thin second border around the entire image. 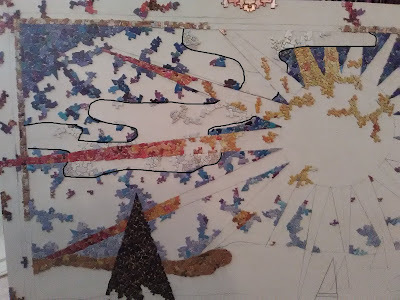 And, even more recently, I completed the second sand dune and one tree!!!! 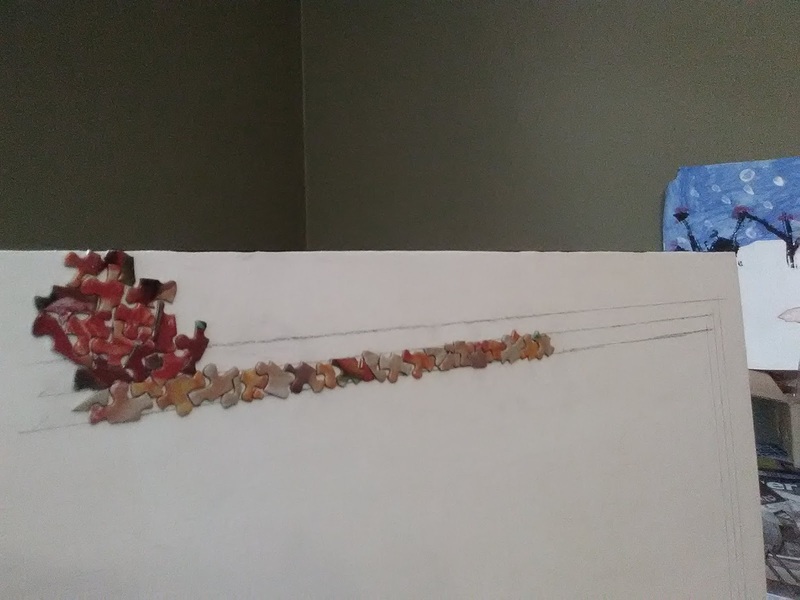 I love it when parts of the image are done! I just don’t have to think about them anymore! It allows me to focus my thoughts on other aspects of this art…. and this artwork has quite a lot of other aspects!!! 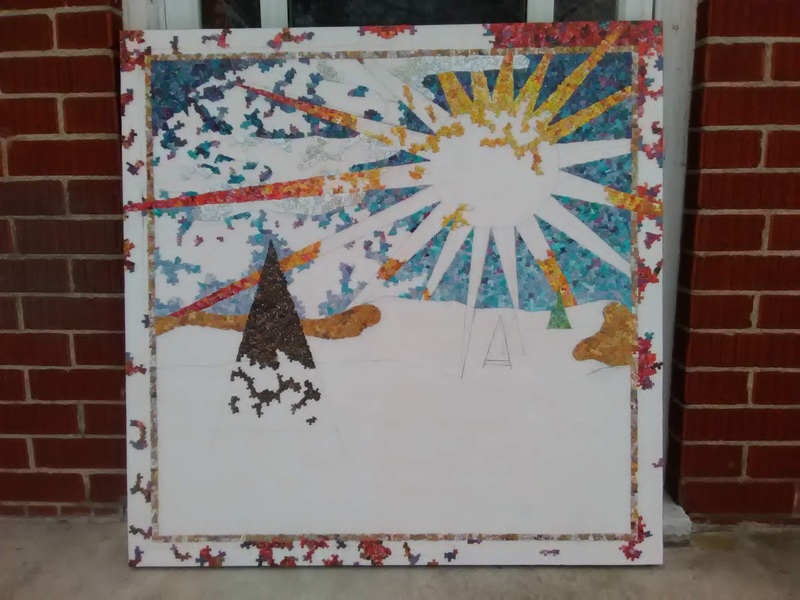 For the last two weeks, Devon and I have been working very diligently on this art project! So nice! The entire right side of the sky is done! Can you see the transition from dark blue at the top to light blue along the horizon???? 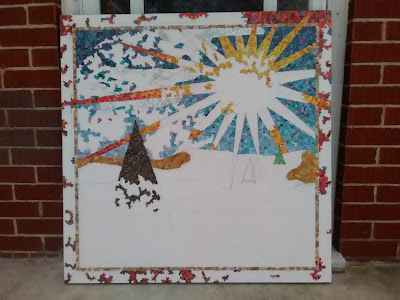 Although the left side of the sky still needs a lot of work, I have completed the sky surrounding the circle of the sun so it is very clear to see the shape! 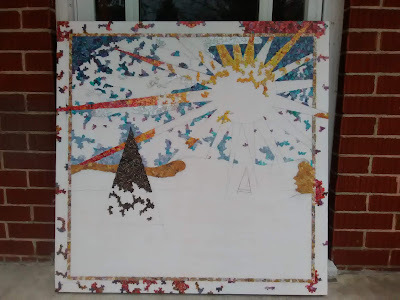 Over the last week, I've been working on the clouds, the large tree and parts of the border! 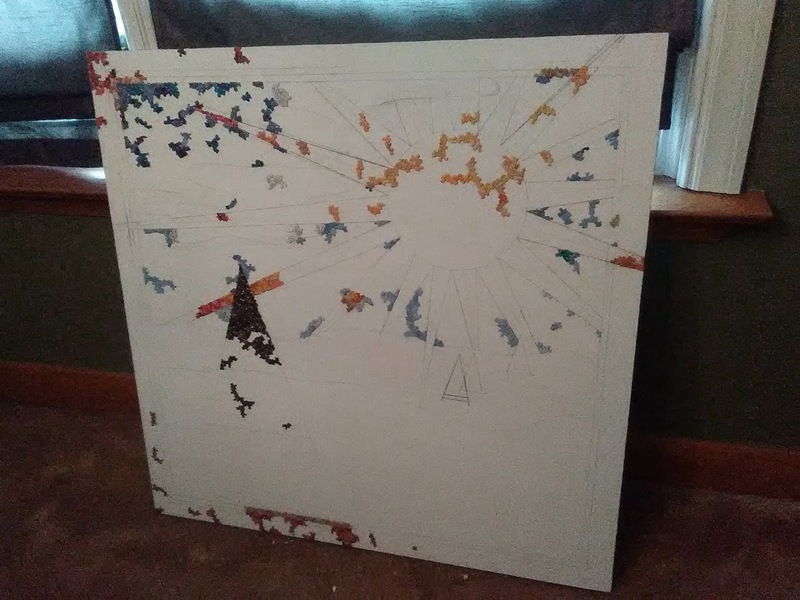 This work isn't the most exciting, but I don't want to end this project doing the boring parts, so I pick away at them throughout the entire process! We've got more to share!!!! Drop by in another week and see how much more we've got done!! !